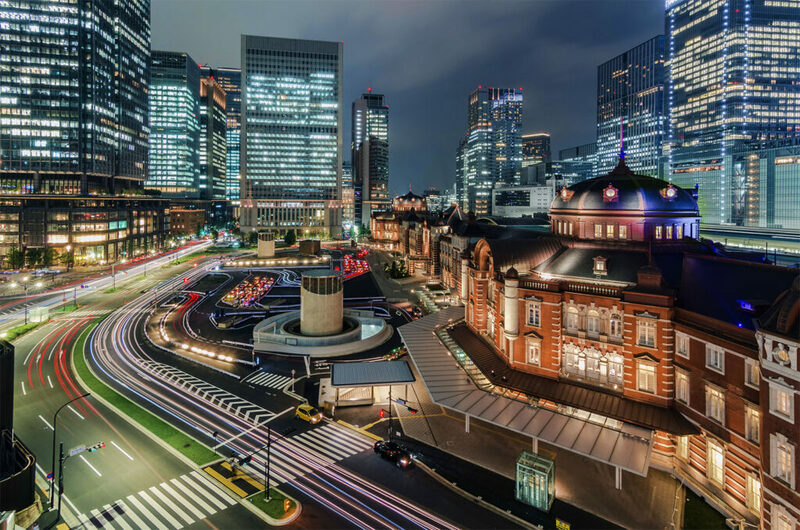 Tokyo Station東京駅・とうきょうえき (東京: 東 – East 京 – Capital) is the beating heart of Japan’s transportation network. With over 4,000 trains passing through the station per day (not to mention all the buses and taxis available as well), you can get anywhere in the city from this station. Every 新幹線しんかんせん・Shinkansen but one starts and terminates here, as do 5 regular 電車でんしゃ・train lines and one subwayメトロ・めとろ line. The original Tokyo Station building, on the 丸の内まるのうち・Marunouchi side, was recently restored to its original 1914 appearance. It’s red brick construction and graceful dome roofs are something to admire. The station also houses a large number of restaurants and stores making it a great place to do some shopping or grab a bite to eat. The prestigious Imperial Palace皇居・こうきょ is just two blocks to the west of Tokyo Station, and with Edo-era moats, walls, gates and gloriously landscaped gardens they’re an ideal place to go for a stroll, and to take in some culture. Wanna feel like the 天皇陛下てんのうへいか・Emperor of Japan? Tours of the 皇居こうきょ・Imperial Palace are available with a reservation made at least one month in advance.